The following answers the questions we’ve often been asked in the past, but if you’ve one that we’ve not, please do ask us. Is a wall mounted barbecue completely safe? Safety is absolute paramount and SpaceGrill has been designed and undergone extensive tests to ensure this, combining various features to provide complete peace of mind. 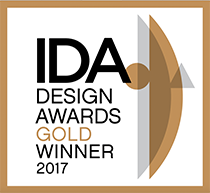 Both the design of and the way SpaceGrill is mounted ensures no heat is transferred through the bracket to the wall or load bearing structure. The splashback also deflects heat from the cooking surface away from the wall/structure, as well as stopping residue or splashes marking it. The sides of SpaceGrill are also double skinned, which ensures that surface temperatures are within acceptable tolerances for human touch. Further, SpaceGrill now contains thermocouple valves, which automatically cut off gas supply should the flame be extinguished by the elements. In some countries the presence of these valves makes an appliance safe and legal for indoor use. SpaceGrill though is primarily intended for outdoor use, with the thermocouple valves allowing SpaceGrill to be used in spaces that might by law be classified as indoor, such as enclosed balconies i.e. three sided. Currently SpaceGrill is certified in Australia (AGA marked) and Europe (CE mark), with registration in the United States of America (ETL marked) pending. Where is the best location for SpaceGrill? There are a few matters to consider when deciding on the best location. SpaceGrill should be mounted to a vertical wall or structure that has a load bearing weight over 50kg (SpaceGrill weighing 35kg with the cast iron hotplates and stainless steel grill in place – those together weighing over 9kg – while the pivot weight is 15kg). 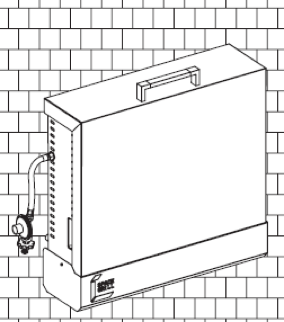 SpaceGrill folds down into a vertical position when not in use, so the requisite area beneath the wall bracket should be free of permanent objects such as outdoor taps. Allowance should also be made for the splashback, which inserts behind the cooking surface when in use (see the below diagram for the relevant measurements). Also, don’t forget to factor in space for cooking! And for those that want SpaceGrill to be located in various locations there are two options: additional wall brackets or a portable stand. Does SpaceGrill need to be assembled? No – SpaceGrill comes fully assembled. 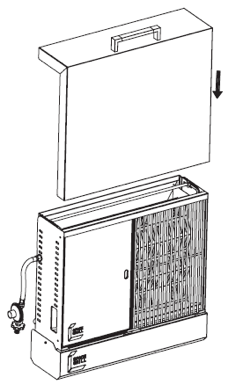 How is SpaceGrill mounted to the wall or other vertical load bearing structure? Installation is straight forward and simply involves affixing the mounting bracket to a wall or other load bearing structure using the eight screws supplied. Just watch our installation video and see how simple it is. 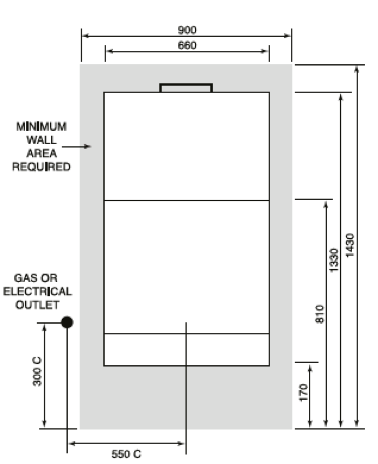 What if there isn’t a suitable wall/vertical load bearing structure? Or you don’t want a bracket affixed to a wall/structure? We appreciate that some people won’t always have a suitable exterior wall or structure to mount a SpaceGrill on. There are others who either can’t or prefer not to have a bracket affixed. SpaceGrill offers a portable stand with these people in mind. This stand also allows for SpaceGrill to be used in a variety of locations, including away from the home. What bottled gas should be used with SpaceGrill? 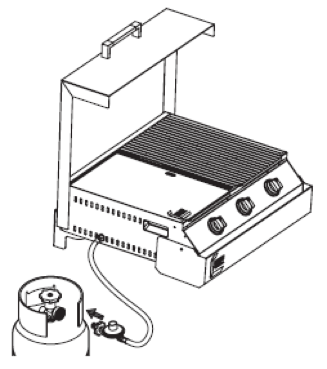 SpaceGrill is a gas barbecue that can operate off both propane and butane liquid gas. It comes standard factory issue with a propane regulator valve so immediately ready to run off propane bottled gas (also referred to as patio gas). If you wish to change your SpaceGrill to butane we would recommend that a registered gas engineer replace the regulator valve to avoid any risk of invalidating the warranty. Can I use a longer hose so that the bottled gas can be located further from SpaceGrill? SpaceGrill comes comes standard factory issue with a 90 cm hose. It is possible to use a longer hose if you would like the bottled gas to be located further from it. How long this hose can be varies from country to country (in many countries it is 1.5 metres). If you wish to fit a longer hose we would recommend that a registered gas engineer replaces this to avoid any risk of invalidating the warranty. 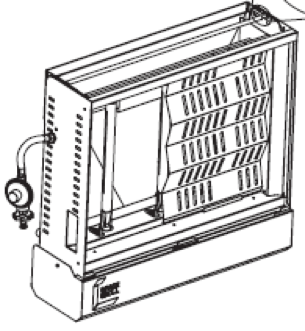 Can SpaceGrill be converted from use on bottled liquid petroleum gas to mains supply natural gas? 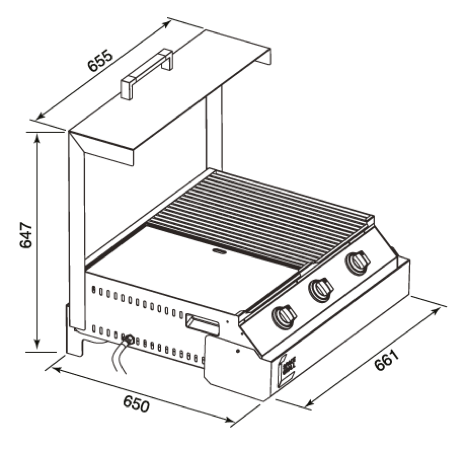 SpaceGrill is a dual fuel gas barbecue, so can operate off natural gas (methane). For safety reasons, we do not offer conversion kits from liquid petroleum gas to natural gas. If you want your SpaceGrill to operate off mains gas then a certified gas engineer should carry out the conversion. We can advise on the steps involved and the specific components required, which vary from region to region. Is it possible to cook with charcoal on SpaceGrill? SpaceGrill is a gas barbecue. However, we do offer as an accessory a charcoal tray, which allows people to cook using charcoal when time permits. This tray sits under the grill section of SpaceGrill and replaces the flame tamer. To ensure that the charcoals are ready to cook on as quickly as possible the gas burners are used to light the charcoal and swiftly bring them to a state of readiness. At this stage the gas burners are turned off and you can begin cooking. Are there any steps to be taken before using SpaceGrill for the first time? Neither the ceramic coated cast iron hotplate nor stainless steel grill require “burn off” prior to first use. However, the cast iron hotplate should be “seasoned” before first using your SpaceGrill – see General Care & Maintenance (below) for how to do this. We also recommend washing the grill in a mild soap and warm water solution. How easy is it to pull up SpaceGrill into horizontal cooking mode? And then return it to storage position? Central to SpaceGrill’s design is a patented pivot mechanism in the mounting bracket that makes it easy to lift it into horizontal cooking mode. This mechanism ensures SpaceGrill only has a modest 15kg pivot weight. This can be reduced by removing the cast iron hotplate and stainless steel grill (together over 9kg), before lifting and locking SpaceGrill into horizontal cooking mode using the recessed handles on its sides. The locking device is simply activated by lifting SpaceGrill slightly above horizontal and pushing inwards towards the wall – and is unlocked by lifting slightly and pulling outwards away from the wall. SpaceGrill’s cover converts into a splashback that slots behind the hotplate and grill when in horizontal cooking mode and then reverts back to a cover after returning to its vertical storage position. Where does cooking residue collect when SpaceGrill is in use? The patented internal drip system prevents any runoff escaping from SpaceGrill whether in cooking mode or folded down in storage position. Key to this is the pivoting drip tray, which is designed to collect runoff in any position from horizontal cooking to vertical storage. How easy is it to clean SpaceGrill after use? Once the cast iron hotplate, chef-grade stainless steel grill and flame tamer have been removed, the shallow cook box is straightforward to wipe down, with any cleaning run off simply collecting in the detachable tray. 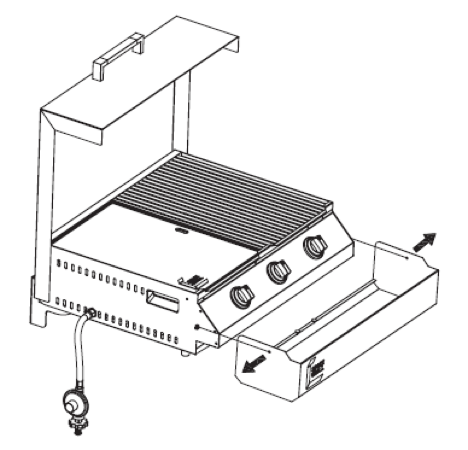 For stubborn residue that a mild soap and water solution cannot remove, we would advise a specialised barbecue cleaner to clean the cookbox, of which there are many on the market (see under General Care & Maintenance for separate instructions on cleaning and maintaining the hotplate and grill). 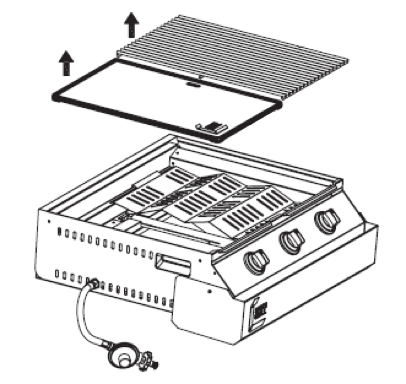 Once you’ve finished cleaning the cookbox, simply remove the detachable tray (see diagram below) and dispose of the runoff in a suitable place. 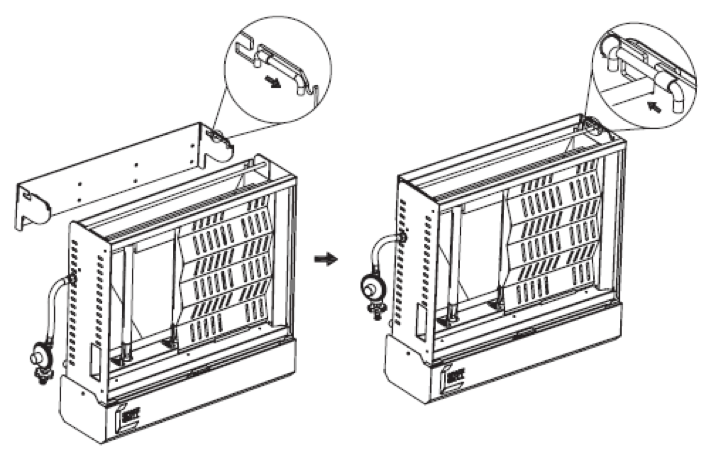 To accelerate the collection of cleaning run off, SpaceGrill can be lowered briefly into the vertical storage position. What should be used to clean the stainless steel exterior? For best results we would advise the use of stainless steel cleaners. There are various such products on the market that are designed not only to clean, but also maintain and protect stainless steel, as well as provide a high shine. I’m not sure how to take care of the cast iron hotplate. What should I do? Step 1: Clean the cast iron hotplate with warm soapy water and then rinse thoroughly and dry. Step 2: Apply a layer of fat all over (fats high in saturated fats are recommended, such as palm or coconut oil, but vegetable oils are an acceptable substitute). Step 4: Turn off the burners and let the hotplate cool down. Step 5: When the hotplate is merely hot to the touch apply a vegetable oil to the surface and then let the hotplate finish cooling. I’m wondering how best to clean the stainless steel grill? We recommend cleaning your stainless steel grill every time you use SpaceGrill. One of the most effective tools for cleaning the grill is a soft brass wire brush. Simply heat the grill on high first before using the brush to remove any leftover food particles. For a post-cook clean – or to remove any residue spots – we recommend washing the grill in a mild soap and warm water solution using a steel wool. Do I need to clean the stainless steel burner tubes? If so, how? Corrosion can form on burner tubes and occasionally spiders and insects build webs and nests inside the tubes. A brass wire brush is suitable for removing any surface corrosion. Blocked ports can be cleaned with a fine wire such as an opened paper clip, making sure not to enlarge the burner ports. Webs and nests can obstruct gas flow causing the burner to burn with a soft yellow or orange flame. It can also result in fire in or around the burner tubes (this is called a flashback and can seriously damage SpaceGrill causing fire at the air shutters underneath the control panel). A nest or web can only be removed by cleaning the inner tubes. We recommend that a registered gas engineer remove the burners so as to avoid any risk of invalidating the warranty. How do you replace the stainless steel burner tubes? We recommend that a registered gas engineer replace burners so as to avoid any risk of invalidating the warranty.